The Hillsborough county commission has created another mess. They continue to waive one of their own policies that has no waiver provision provided in it. In addition, the commissioners ignored the intentions of a Charter that created an independent special taxing district. Why? Because they or someone(s) wants control of that taxing entity. The timing is not coincidental since it relates to the Hillsborough Area Regional Transit Authority (HART). What the commissioners have done as a result of their recent HART Board appointments is disenfranchise HART's property taxpayers who reside in unincorporated Hillsborough. Independent special districts have limited explicit - not implied - authority specified in its charter. Statutes, charters and policies provide the requirements, criteria and governance for establishing Boards, Committees, Authorities, Councils or Agencies and who may get appointed to them. 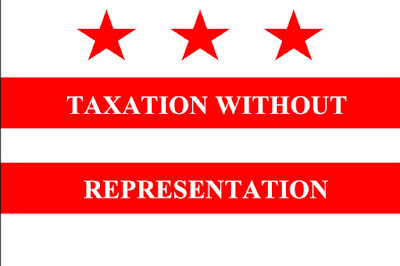 In the interest of fairness, proportional and equitable representation is often a requirement, especially if the Board will be providing governance and oversight of a taxing authority. Florida Statute 163.567 enabled the creation HART by allowing a home rule Charter to establish the transit agency. HART was founded in 1980 by a local Charter approved in 1979 by the county commission of Hillsborough and the city council of Tampa. HART's Charter defines a HART Member as "the unincorporated areas of a county or the incorporated areas of a municipality if such county or municipality has been admitted to membership the Authority.."
HART's Charter states each HART member shall appoint one Director plus one additional Director for each 150,000 persons, or major fraction thereof,resident in that member's jurisdictional limits. In addition to those Board members, the Governor of Florida shall appoint two Directors. HART's Charter specifies they are a special taxing district and may levy an ad valorem (property) tax not to exceed one half mill ($.0005) on taxable property within the jurisdictional limits of its members. Current jurisdictional members of HART include city of Tampa, city of Temple Terrace and unincorporated Hillsborough County. Plant City is not a member of HART and Plant City residents do not pay HART's property tax. Citizens appointed to this board must reside in the unincorporated area of Hillsborough County. ..applicants for certain boards/councils undergo background checks and/or be residents of the unincorporated area of Hillsborough County. All applicants must be residents of the state of Florida. In an effort to have boards/councils that include citizens who represent the entire county, the BOCC shall largely consider race, gender, and those citizens who actively participate in the community when making appointments and/or confirming nominations. Unless specifically approved by the Board of County Commissioners, no citizen may serve on more than one committee at a time. If an applicant does not meet the relevant requirements the application shall be rejected. Residency for appointment/confirmation applicants. The Board of County Commissioners has not established a general residency requirement for all board, council, committee, and/or authority appointments. However, citizens seeking appointments to the following boards councils, committees, or authorities shall reside in the unincorporated area of Hillsborough County. *Unincorporated residency requirements for the Tampa Sports Authority only may specifically be waived by the Board of County Commissioners (see Waiver Procedure below). ARTICLE V. WAIVER PROCEDURE The notice of a vacant position for the Tampa Sports Authority shall include a statement informing the public that the Board of County Commissioners has the authority to waive its unincorporated residency requirement, that, notwithstanding residency status, all citizens may apply; and that all names shall be presented to the Board of County Commissioners for consideration. The Boards and Councils Coordinator shall list all names on the ballot and identify those persons who met the residency requirement and those who did not. Note: there is only a residency waiver procedure for appointments to the Tampa Sports Authority. Now let's review the unincorporated Hillsborough appointments made by the county commissioners since 2012. The make up of the 7 HART Board members representing unincorporated in 2012 included 3 electeds, Beckner (lived in unincorporated), Murman and Sharpe (both lived in city of Tampa), and 4 citizen appointees Wallace Bowers, Karen Jaroch, Ann Madden and Steve Polzin who all lived in unincorporated Hillsborough. Then along came the county's Policy Leadership Group (PLG) transportation initiative in 2014 led by the unelected County Mayor Mike Merrill. About the same time that Ann Madden resigned from HART on June 16, 2014, Merrill was proposing a hostile takeover of HART by all electeds and creating some transportation super agency - see our post here. The commissioners never sought a citizen appointee to replace Madden, who lived in unincorporated and resigned June 16, 2014. 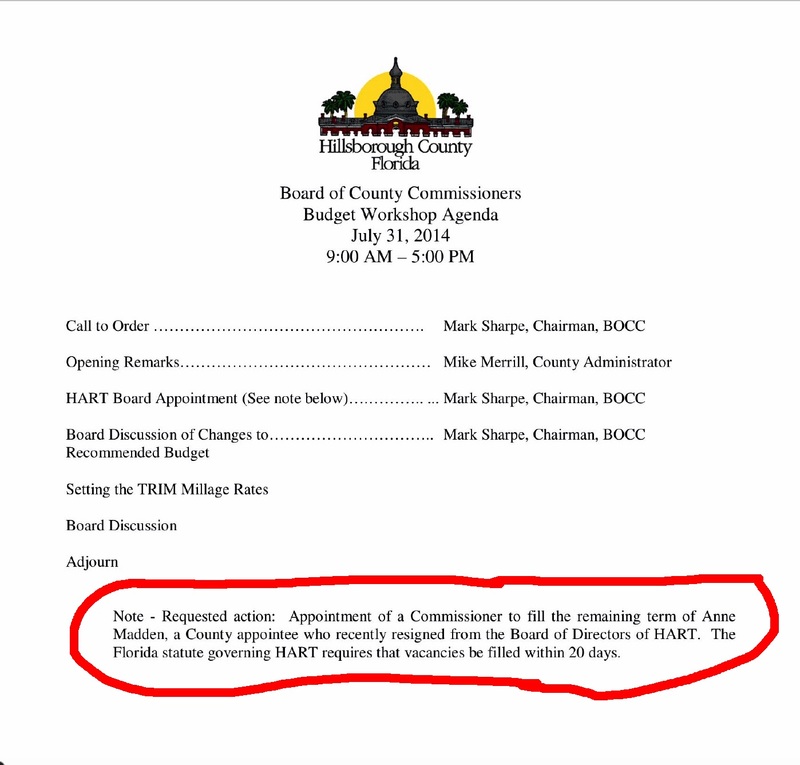 Instead they sneakily used a July 31, 2014 Budget Workshop meeting, where public comment is not normally allowed and actions are not supposed to be taken, to appoint Madden's replacement on HART. That agenda item was added at the last minute to a meeting that had been publicly noticed as a Workshop. This action occurred coincidentally right before the county handed Parsons Brinckerhoff their crony contract to launch the Go Hillsborough tax hike campaign. And they even knew they weren't following the rules because the workshop agenda noted they were supposed to have filled the vacancy within 20 days of the resignation. In perfect orchestration at that workshop, Sandy Murman nominated Les Miller and Kevin Beckner seconded her nomination. The commissioners voted 5-1 to appoint Miller, who lives in the city of Tampa, to replace Madden, who lived in unincorporated south county. Higginbotham was absent and Crist voted no. Appointing Commissioner Miller to the HART Board changed the balance of the HART board. It tilted it toward more county electeds and more Board members who live in the city of Tampa. As of 8/1/2014, the 7 HART Board members representing unincorporated consisted of 4 electeds (Beckner, Miller, Murman, Sharpe) with only Beckner living in unincorporated Hillsborough and 3 citizens (Jaroch, Polzin, Bowers) who all lived in unincorporated. The three citizen appointees terms were expiring in November 2014. In October 2014, 17 applicants had submitted applications for a county appointment to HART Board. All three citizen appointees (Bowers, Jaroch, Polzin) applied to be reappointed. Steve Polzin is our local transit expert who works at CUTR, our own transportation think tank at USF. Having a transit expert on HART Board makes total common sense. And Polzin lives in unincorporated Lutz, satisfying the residency requirement. Apparently not to the county commissioners. There were some political games to play. This appointment was occurring during the PLG transportation effort when Parsons Brinckerhoff had just been awarded their crony contract to kick off Go Hillsborough. Find all 17 HART Board applications here. 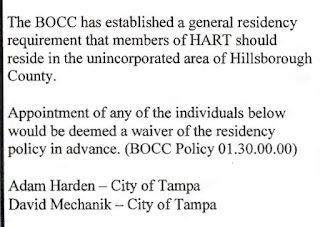 A note below was included in the board packet of HART Board applicants stating that the BOCC can simply waive the residency requirement with their vote, without any discussion or a motion passed to do so. The commissioner's own BOCC policy 01.30.00.00 provides for a residency waiver only for Tampa Sports Authority appointments. When did the commissioners approve changing their policy to waive residency requirements for HART appointments? Or does Mike Merrill and the commissioners just make stuff up to fit an agenda? According to the transcript of the October 15 BOCC meeting, there was no motion or discussion to waive their own policy. The commissioners just voted. They reappointed Jaroch and Bowers, who lived in unincorporated and appointed Mickey Jacobs, who lives on Harbour Island in the city of Tampa. Jacob's experience as an architect made him a favorable option because of his focus on economic development, a key issue for the area. The county commissioners tossed Steve Polzin off HART who was the only transit expert on the transit authority board for someone who's focus is economic development. By October 2014 the HART Board tilted more towards members who lived in the city of Tampa. Only 3 of the 7 county appointed HART Board members lived in unincorporated. Subsequently Commissioner Sharpe was term limited and Stacy White elected in November 2014. White, who lives in unincorporated, replaced Sharpe on HART Board. Then in November 2016 Beckner was term limited and Pat Kemp was elected. 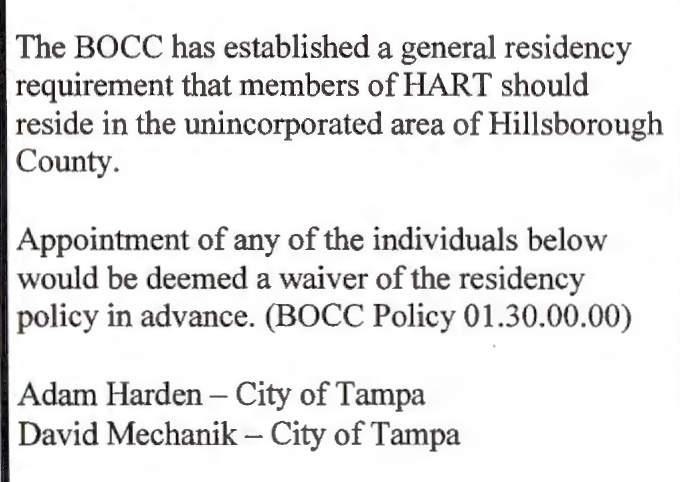 Kemp who lives in the city of Tampa replaced Beckner (who lived in unincorporated) on HART. The three citizen appointees terms were expiring in November 2017. Two of the three county citizen appointees, Jaroch and Bowers who both live in unincorporated, reapplied and Mickey Jacobs, who lived in the city of Tampa, did not reapply. The county received only 7 applications which can be found here. Again there is a note in the Board packet that the commissioners can simply waive their own residency requirement. The commissioners actions were perfectly orchestrated again at the October 18, 2017 BOCC meeting. When the appointee agenda item came up, Commissioner Miller immediately made a motion to waive the residency requirement and Commissioner Murman seconded the motion. The motion passed 7-0. This go round the commissioners formally passed a motion instead of just voting as they did in 2014. But there was no discussion about the motion - it just passed unanimously 7-0. Murman chose Adam Harden, Marvin Knight, David Mechanik. Murman prefaced her vote by some carefully worded mumbo jumbo about the two current board members being on the board quite a while and she wanted to rotate her appointments. Wallace Bowers had been on the board for about 18 years but Karen Jaroch had served for 6 years, less time than Sandy. Jaroch was the only county citizen appointee that was a woman and Murman tossed her off to vote for 3 males. We found this Times article highlighted on Murman's campaign website about her efforts to help women get appointed to committees and boards and that women should be helping each other. That was 2014. Do those statements still mean anything or just more mumbo jumbo? Ironically, David Mechanik already had served as a city of Tampa HART Board appointee for 16 years between 1994 and 2011 - so much for worrying about being on the HART Board for "quite a while".....And Mechanik, who all 7 commissioners voted for, was on HART Board when HART gave us the Alternatives Analysis for the 2010 rail tax that was overwhelmingly defeated. Three males, including Adam Harden and David Mechanik, who both live in the city of Tampa, and Marvin Knight, who lives in unincorporated were appointed to the HART Board October 18th. The county commissioners tossed Bowers and Jaroch, who live in unincorporated and abide by the residency requirements, off of HART Board. They were replaced by 2 appointees who live in the city of Tampa. According to the University of Florida BEBR, about 50% of Hillsborough county's population is female. The only county citizen appointee who was a woman and officially qualified, according to county policy and the Charter by living in unincorporated, was not reappointed. No woman was appointed by the county. The commissioners could have delayed their HART Board appointments if they had wanted more applicants. They did not and that is telling. How did their actions impact the representation of the governing board of this independent special taxing district? Five of the 7 (over 71%) of the HART Board members appointed to represent HART's unincorporated jurisdiction reside in the city of Tampa. An overwhelming majority, 10 of 13 or 77% of all the HART Board members reside in the municipalities of Tampa and one member from Temple Terrace. That leaves 3 of 13 or 23% of the Board members who reside in unincorporated. Over 2/3 (67%) of the total population of Hillsborough county resides in unincorporated and about 2/3 of the property taxes paid to HART comes from unincorporated and the city of Tampa receives most of HART's services. The issue is the HART Board is totally upside down now with regards to who is paying the vast majority of HART's taxes and the overwhelmingly majority of HART Board members governing HART who reside in city of Tampa. HART's Charter clearly defines HART members as unincorporated ORincorporated municipalities that have been admitted. We are not lawyers but the use of the word "or" represents alternatives (apples or pears) when separating nouns. "Or" is used for exclusiveness because unincorporated Hillsborough or an incorporated municipality could withdraw as a member of HART. The commissioners have created another mess. Their own policy that requires HART Board appointments must live in unincorporated has no waiver provision. They just made it up. Merrill used the waiver procedure that county policy states is only for Tampa Sports Authority appointments on the board packet for the HART Board appointments. It's never a good idea to simply waive policies without any discussion of the ramifications. Policies are put in place for a reason, especially policies affecting a governing board of an independent special taxing district created by a governing Charter. Did the commissioners also violate HART's Charter? That is a legal question that should be answered. Is a remedy needed? Does anyone have standing to sue the county? At the very least, taxpayers in unincorporated should put a microscope on HART and watch their every action. 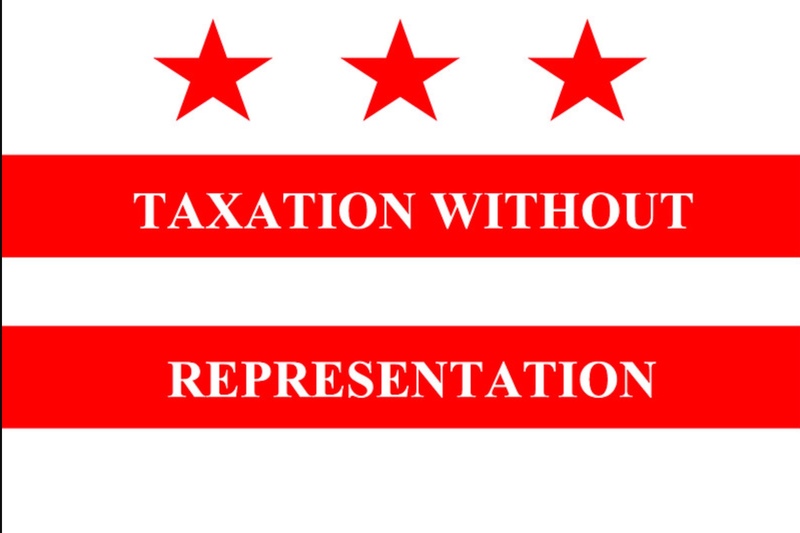 This time the commissioners created an issue of taxation without proportional and equitable representation. Their actions have disenfranchised the vast majority of HART's property taxpayers who reside in unincorporated Hillsborough. No wonder there is little or no trust left with County Center.